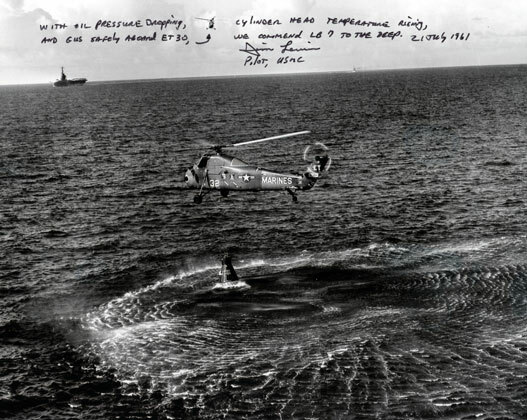 USMC Pilot, call sign "Hunt Club 1"
can be clearly seen in the first two images as he treads water waiting to be rescued. "A very heavy LB7" as Hunt Club 1 struggles to keep LB7 aloft. Awesome inscription! Recovery carrier USS Randolph is noted by Lewis as you can see in the scan. Very nice! Measures 10" x 8". "Wheels Dripping" shows Lewis struggling to maintain a grip on Liberty Bell despite the weight causing overload and a warning light signaling potential catastrophic engine failure. Lewis hand signs and inscribes in black sharpie. Measures 10" x 8". 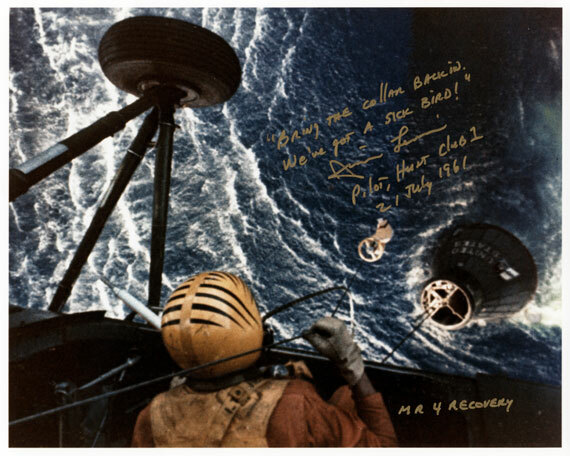 "We Commend LB 7 To The Deep" captures the moment Hunt Club 1 Pilot Jim Lewis was forced to release the cable holding Liberty Bell 7. 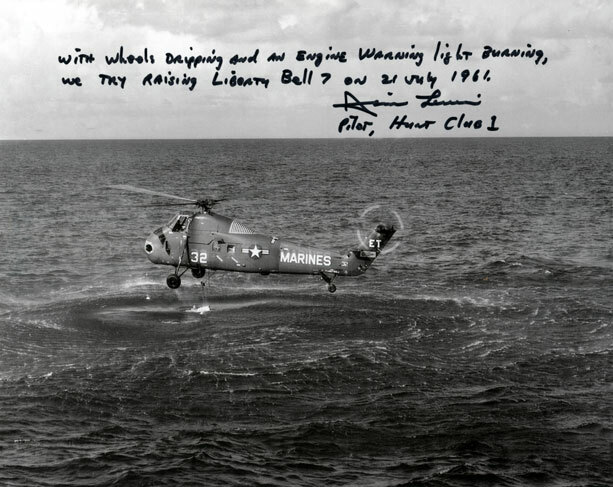 It was hopeless at that point and Lewis put up his best fight but the cockpit engine warning indicator and the weight of the flooded capsule created a situation putting his helo at real risk of engine failure. 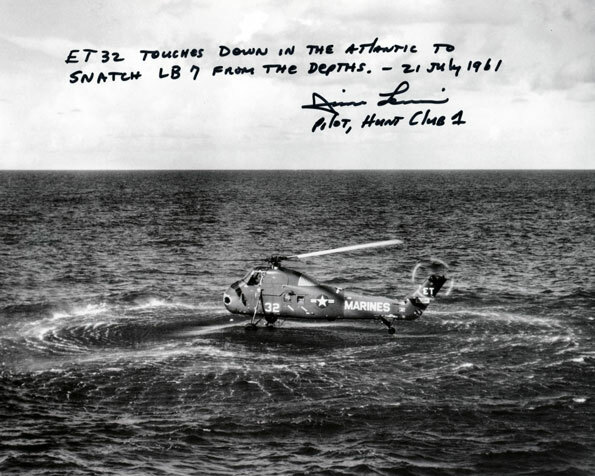 It may be difficult to see in the scan but this image shows the actual moment the cable was released allowing LB-7 to sink to the ocean floor where it would remain until Curt Newport discovered and raised it many years later. 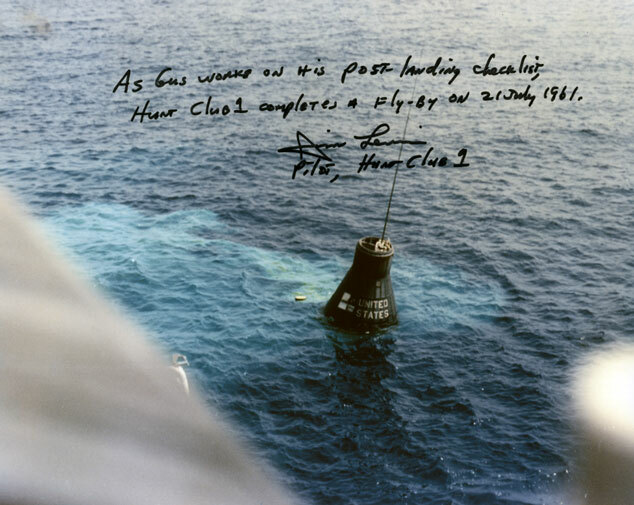 The lengthly description on this image is awesome and Lewis who signs neatly in black sharpie adds his call sign, "Hunt Club 1". Measures 10" x 8". 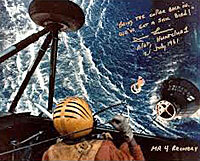 "Water Landing" shows the amazing effort put forth by Jim Lewis to save Liberty Bell 7 from sinking. His wheels were actually in the water as the flooded spacecraft dragged his helo down with it, ultimately prompting him to release the cable. 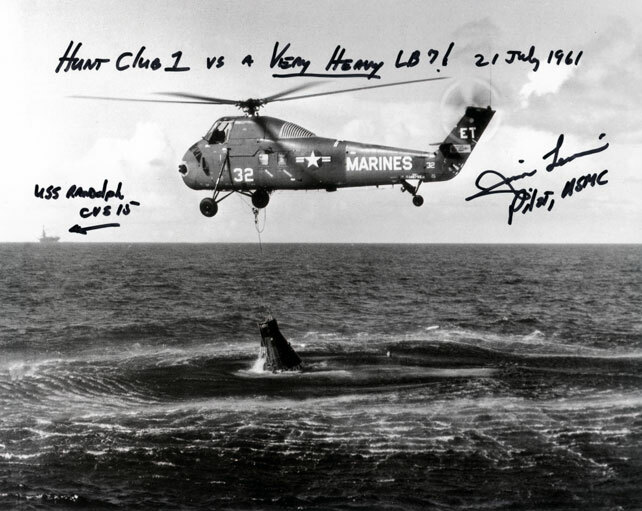 An amazing inscription and signature by Jim Lewis as you can see in the scan. Measures 10" x 8". "Sick Bird" shows Hunt Club's co-pilot attempting to latch on to LB7 in it's final moments above the surface as it takes on water at an overhwelming rate. 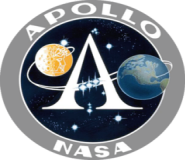 Lewis's long quote is referring to the need to abandon the effort as the engine warning lights of their helo are indicating potential engine failure. Beautifully hand signed in gold paint pen. Measures 10" x 8"
"Hunt Club 1 Flyby" shows the scene as Recovery Pilot Jim Lewis completes his initial flyby while Gus is completing his post landing checklist. This was taken just before the hatch blew, flooding LB-7. Beautifullly hand signed and inscribed by Jim Lewis who adds his call sign, "Pilot, Hunt Club 1". Measures 10" x 8".